daily timewaster: Man, I remember those buzz cuts. Man, I remember those buzz cuts. We had them every summer to tide us over during the warm summer vacation months when school was not in session. There were some Indian kids who lived near us who received Mohawks and I was always envious. Yep, all the boys had them for summer vacation in my family. Dad, would line us up and shave our heads. And the moccasins too! I still wear them around the house and as house slippers... Those where the days! All the guys in the family got beginning of summer buzz cuts. I had jeans with cuffs (for getting taller), and patches inside the knees so they wouldn't wear through so fast. Leather sandals in summer and moccasins (they were called teepee creepers in cowcamp) as house shoes. My dad told me we got buzz cuts for the Summer so they could find the bugs easier. (We called the crew cuts. )The barber would use some sort of stick goop to make the front stand vertical (think Kurt Russell in Stargate). yep, me too - and I remember after a day playing outside, the grass, sticks and bugs that would have collected in the cuffs. In the summer, mom would get out the sulfur pad and dab it around our waistband and on the tops of our socks so the chiggers wouldn't eat us up (Dallas and evirons in the late 50's). 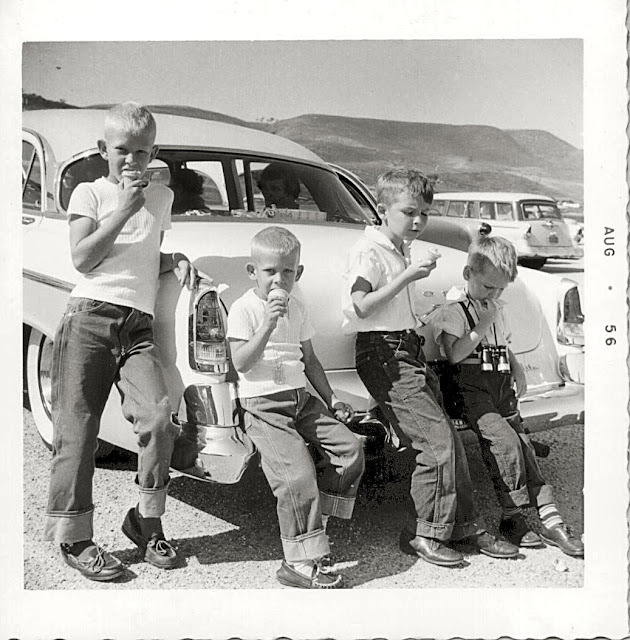 The cars show the pic to be at least 1956 seeing the '56 Chevy wagon in the back - looks like a Bel Air Beauville. I also like the huge white sidewalls on the car the kids are leaning on. The kid on the right doesn't an ice cream and he doesn't look happy about it. That boy might be looking at the remains of his ice cream on the ground in front of his right foot, where he dropped it. Which would also explain his expression!